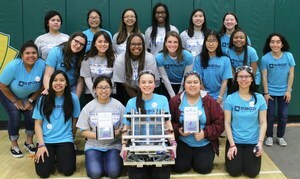 NDA Wins the 3rd Annual VEX Robotics All-Girls Showcase at La Reina! NDA Robotics came home with 2 awards: Tournament Champions and the Build Award. The Build Award is given to a team who constructs a reliable robot with attention to detail and creative use of materials and who demonstrates team work and quality of student interviews with judges. Also, eight students on the NDA Robotics Team volunteered to help make the event a huge success! Great job R2G2.